Iran’s supreme leader passionately defended last week’s presidential election process Friday, praising President Mahmoud Ahmadinejad’s election as a "definitive victory" and sloughing off charges of vote-rigging. Ayatollah Ali Khamenei addressed a crowd at Tehran University in a sermon during Friday prayers. His speech was greatly anticipated amid massive protests from supporters of opposition leaders such as Mir Hossein Moussavi, who disputed the government’s assertion that Ahmadinejad won in a landslide. While Khamenei called on those who don’t believe the results to use proper legal avenues, such as requesting the recounting of ballots in their presence, he did not issue a call for a new vote. He also criticized the street protests and said those who caused violence during demonstrations would be held accountable. Khamenei said Ahmadinejad got more than 24 million votes, defeating Moussavi, his main challenger. “Eleven million votes difference Sometimes there’s a margin of 100,000, 200,000, or 1 million maximum. Then one can doubt maybe there has been some rigging or manipulation or irregularities,” Khamenei said. “But there’s a difference of 11 million votes. How can vote rigging happen” he asked. He lauded the election as a “political earthquake.” “The 10th presidential election was actually a great show in which people indicated their responsibility towards the destiny of their country. It was a great manifestation of people’s participation in the affairs of their country. It depicted very well people’s solidarity with their establishment,” he said. Khamenei praised the 85 percent voter turnout of about 40 million people, but said that some critics “wanted to indicate that as a doubtful victory. Some even wanted to show that this is a national defeat. “They wanted to give you bad taste in the mouth. They could not see that the highest turnout in the world goes down in history in your name, but that happened. It’s recorded in history in your name. They cannot manipulate it no more,” he said. The supreme leader took on what he considers enemies of Iran — the United States, Britain, Israel, and apparently those inside the country — for manipulating and undermining the process. Watch Khamenei defend the outcome of the election » He criticized international media messages that the election pitted people who support the government against those who oppose it. He said all four candidates — Ahmadinejad, Moussavi, Mohsen Rezaie and Mehdi Karrubi — support the Islamic revolution. Watch how world has reacted to the election » “Enemies try through various media, and some of those media belong to the Zionists, ill-wishers. They try to make believe in those media that there is a fight between supporters of the Islamic establishment and the opposition, no that’s not true. They have no right to say that. That’s not true,” he said. The supreme leader said the Obama administration has passed along mixed messages about relations between the United States and Iran, saying the president lauded the street protests but also extends an olive branch to the government. “Which one should we believe” he asked. At various junctures through the talk members of the crowd chanted: “Allah is Great,” “Death to Israel,” “Death to America,” “Death to Britain.” Since Iran’s 1979 Islamic revolution, sermons during Friday prayers have been delivered by prominent officials, including the supreme leader, on usually important occasions. Friday’s appearance comes at what observers call a critical juncture in Iranian history. Since last Friday, tens of thousands of demonstrators have taken to the streets of Iran’s capital every day to protest election results. Some estimates put the total number of participants in the hundreds of thousands. iReport.com: Share images from Iran When Iranian TV airs Friday prayers, the camera regularly focuses on important officials. In this case, the event was noteworthy for who was there, as well as for who was not. Ahmadinejad and Rezaie attended, but Karrubi and Moussavi — who called for a boycott of the prayers — were not seen. Parliament speaker Ali Larijani, who has had a tense relationship in the past with Ahmadinejad, was sitting next to the president. But former President Ali Akbar Hashemi Rafsanjani, who has been in a power struggle with Khamenei, wasn’t shown on the TV broadcast. Rafsanjani is chairman of the Assembly of Experts — which is responsible for appointing or removing the supreme leader and monitoring that body’s attitudes toward Khamenei. Khamenei remained staunch in his defense of Ahmadinejad, saying his views were closer to the president’s than to those of Hashemi Rafsanjani, a supporter of Moussavi. The supreme leader at the same time defended Rafsanjani from charges of corruption made by the president during the presidential debate. He did, however, open the door to corruption charges against Rafsanjani’s relatives. Former President Mohammed Khatami, a supporter of Moussavi, was not shown on the broadcast as well. In discussing Iran’s support of human rights, Khamenei slammed U.S. policies in Afghanistan and Iraq. He even made an apparent reference to the deaths of people — what he called the “burning alive” of 80 men, women and children — during the federal siege of the Branch Davidian complex in Waco, Texas, in 1993. 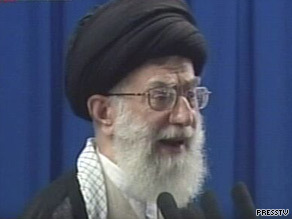 “We have raised the flag of human rights through Islam,” Khamenei said. Q & A: Was the Iranian election rigged?